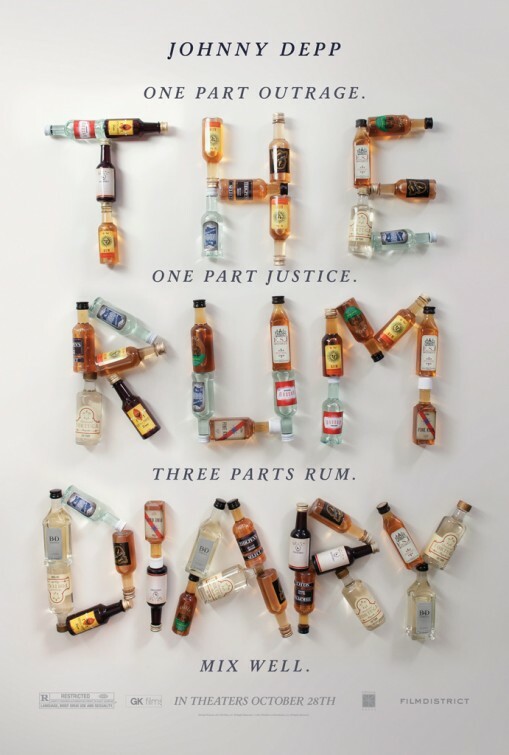 It's tempting to view THE RUM DIARY as a sort of prequel to Johnny Depp's previous turn in a Hunter S. Thompson adaptation, Terry Gilliam's FEAR AND LOATHING IN LAS VEGAS. Even though Depp is ostensibly playing a different character here in the form of alcoholic newspaperman (kind of a redundancy) Paul Kemp, he's still channeling Thompson for his performance just as he did in FEAR. It would have been nice to see Benecio del Toro return as well (he was attached to the film at one time), but Michael Rispoli does a good job in his stead as Kemp's fellow journalist Sala. The film is set in Peurto Rico in the late fifties, and the newspaper Kemp and Sala work for, the San Juan Star, is a second rate rag at best. The paper's editor, Lotterman (Richard Jenkins) seemingly expects big things of Kemp, but that doesn't include publishing articles that might agitate the big corporations who are exploiting the tiny island (and who pay the paper's bills with their ads). Despite the early stirrings of a social conscience, Kemp doesn't push back too hard because, hey, it's a paycheck. That, and the novels he's tried to write have so far gone nowhere due to Kemp's inability to find his voice. Kemp also takes a job to write copy for a group of investors headed by amoral businessman (another redundancy) Sanderson (Aaron Eckhart). The group is looking to build a hotel on an as-yet undeveloped nearby island currently in use as a U.S. military test site. Kemp has some qualms, but again, it's good money. The gig also provides Kemp with access to swank parties and a nice car. Plus there's Sanderson's pretty girlfriend Chenault (Amber Heard) who Kemp is smitten with. THE RUM DIARY is as much about its little detours and asides as it is about any kind of central plot. Kemp and his friends engage in lots of drinking, carousing, and antisocial behavior, thumbing their noses at authority all the way. This being set sometime prior to Thompson's evolution into full-blown drug-fueled maniac, however, it's dialed down a little compared to FEAR. Despite his drinking, Kemp still has rather traditional ambitions towards success as the film starts. It's only as he sees just how corrupt things really are through his experiences that he begins to morph into something resembling the counterculture anti-hero Thompson would become. Far from prolific writer/director Bruce Robinson, himself a recovering alcoholic, clearly gets this material. Sure, being an alcoholic (or a full-blown drug fiend, for that matter) is a bad thing, but there's also a certain romance and sense of adventure to it. This being a Hunter S. Thompson adaptation, of course there's going to be much more of the latter than any kind of moralistic tut-tutting about excessive behavior. Thompson's whole life and philosophy was founded on excessive behavior, and if you're going to make a true adaptation of the guy's work, you're probably going to end up glorifying some things it's probably best not to emulate. Like the best drunken philosophers, THE RUM DIARY manages to stay focused just long enough to actually make a few coherent points before slipping off to do something ill-advised. Certainly its indictment of corporate greed among the “1%” and the powerlessness of the average person to do anything about it should resonate with the current zeitgeist. At times the film does meander a bit, but considering the source material I think Robinson did a pretty good job of shaping it into an entertaining and thought provoking film that can stand both with and apart from FEAR AND LOATHING. 3 1/2 out of 4 stars.